Drum Circle Distillery is the small artisan distillery we visited on Monday. This is a very unique operation run by Troy and Tom who are responsible for putting out some extraordinary rums. The amazing part is that in a very short period of time this little distillery has won "Best in Class" at the Miami Rum Renaissance Festival for it's Siesta Key Silver Rum. Now they have introduced a very nice gold rum and just about ready to release their new spiced rum. By the way we did get the opportunity to taste the spiced rum at the distillery along with some of the newer rums right out of the aging barrels, very interesting experience, if you get the chance you need to try it. "Barrel proofs" as they are called are at the 140 to 160 proof level at which rum is generally aged, giving you all of the taste as well as the "kick" of an overproof spirit. The real difference with the artisan style of rum making is that there is a personal touch to each and every bottle of rum that leaves the distillery. Tom and Troy are there to monitor the fermenting of the molasses, the distilling of the spirits, right down to the hand bottling and labeling of each bottle from start to finish. Their Still is also very unique in that it is a pot still and a column still combined. 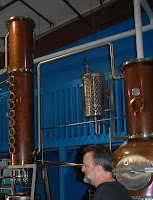 The process begins in the pot still and then the output is piped over to the column still to finish the process. They also can produce just pot stilled spirit by bypassing the column still. Once the spirit distillation is completed, it is either placed in barrels (the gold rum) until aging of the rum is complete or it is taken to he blending area where purified, finished by osmosis water is added to bring the rum down to it's 80 proof level. Then the rum is ready to be bottled. The bottling process is done with a 4 bottle hand unit that they spend the day operating to fill and then hand label each of the bottles before placing them in cases and palatalizing them for shipment. This is a process that takes a couple of days to bottle and label a batch of rum. All and all this is a very labor intensive process that is done with a lot of dedication and passion. The pride in the quality of their product is evident at every level of the process. Their excitement as they pour a sample for us to taste and watching their eyes light up as we give an approving nod after tasting the rums. All of us were impressed with the the passion with which they pursue the excellence of their rums. By the way the new spiced rum is a very exciting product as well, the spice is done differently that most and the results do show. 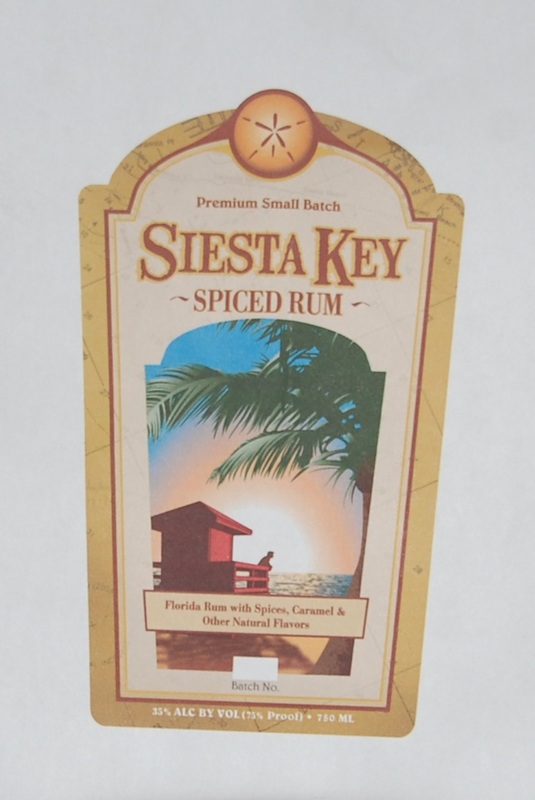 You can start to watch at your favorite bars and liquor stores for this new Siesta Key Spiced Rum in the near future. 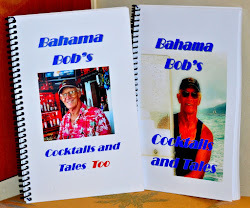 For those of you in the Key West area you will be able to try some just as soon as it is released or who knows maybe sooner at the Rum Bar on Duval Street.